Although Johann Sebastian Bach did not write any music for the guitar, transcriptions of his unaccompanied string music and music for lute have long been a part of the guitar repertoire. Despite the respect that this music commands among musicians and audiences debate still exists as to what constitutes an appropriate means of transcribing, interpreting and performing this music on the guitar. 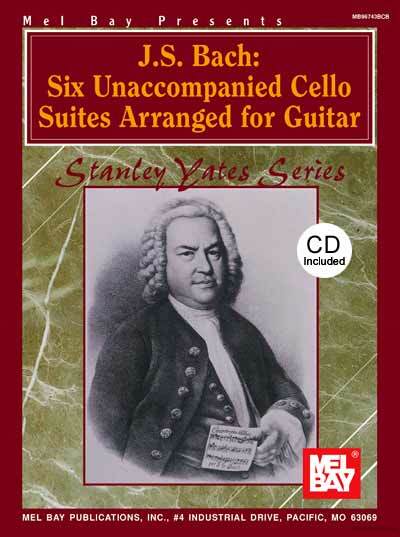 It is this debate that prompted this long-awaited edition of Bach's unaccompanied cello suites by scholar and concert guitarists Stanley Yates. This definitive work includes performance scores, comparison scores and an invaluable 40-page guide entitled Arranging, Interpreting, and Performing the Music of J.S. Bach. Furthermore, the author offers comments on his arranging process and suggestions on using this edition including: ornamentation, slurs, fingerings, notation, and implementation of the comparison scores. Written in standard notation in guitar-friendly keys. The available companion CD contains Suites 1-3 only.